Catholic News World : #BreakingNews 100 Christians Arrested in China who Say "The persecution is a fair price to pay for the Lord". #BreakingNews 100 Christians Arrested in China who Say "The persecution is a fair price to pay for the Lord". One faithful arrested this morning. 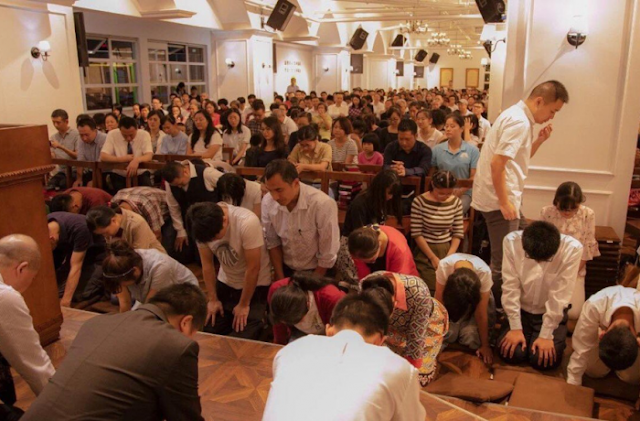 The Early Rain Covenant Church, led by Pastor Wang Yi, counts 500 faithful and 300 sympathizers. Despite being an underground church, members evangelize in the streets, have a seminary and a primary school. Wang Yi had criticized the "cult" of Xi Jinping and the new regulations on religious activities. "The persecution is a fair price to pay for the Lord". Chengdu (AsiaNews) - About 100 Protestant Christians and seminary students were arrested in Chengdu (Sichuan) between 9 and 10 December. Some of the faithful, later released claimed they were "raped and abused" by the policemen who kept them in custody. Among those arrested are Pastor Wang Yi and his wife Jiang Rong (photo 2), taken away by the police; two others, Guo Hai and his wife, were dragged away from home, leaving their two children alone. Others arrested include: Jiang Ruolin, Ge Yingfeng, Zhu Hong, Xiao Hongliu, Ye Yin, Zhang Jianqing, Liu Yingxiu, deacon Zhang Guoqing, Elder Su and his wife, Xiao Yingshan and his wife, Song Engquang and his wife, Xiao Baoguang, Zhou Xiaojuan, Liu Daxuan, and Zhou Yong. Many were arrested at the community headquarters; others were taken from their homes. The arrests continued even today, when Li Yingqiang, who had hidden himself in the first raid and warned the media, was also arrested. All the arrested belong to the Church of the First Rain of the Alliance, an unofficial domestic Church, which is not recognized by the government, led by Pastor Wang Yi. Unlike many underground Protestant Churches, Early Rain Covenant Church practices its faith in an open way; publishes sermons and online studies; evangelizes on the streets of the city; has a seminary for future pastors and a primary school for 40 children. The community has about 500 members and 300 sympathizers. It is not new to arrests and raids. Last June their headquarters was closed because the community had wanted to remember the people killed in the Tiananmen massacre with a memorial service. Some of his members were arrested two months ago because they were evangelizing in the street near the Chengdu station. Although the police did not want to explain the reasons for the arrests, it is very likely that they are the consequence of the application of the new regulations on religious activities that prohibit unsanctioned gatherings. Pastor Wang Yi, described by many as "the most courageous" religious leader in China, has branded the new regulations as a tool to stifle religious freedom. Recently, Wang Yi had also raised his voice against the "cult of Caesar", after the patriotic associations forced Christians to place - often on the altars - the photo of President Xi Jinping.